All is silent as the wooden boat appears to be floating through the air, but in fact is slowly moving along the shallow waters of the Iboih Beach: the waters are so calm and crystal clear that it feels as if it is floating in the air. 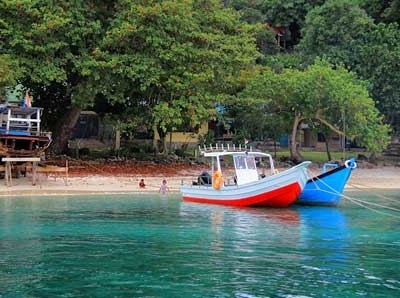 The beautiful and natural beaches at Iboih will surely change your perception of a boat coming in to dock at the pier. Pantai Iboih, also known as Teupin Layeu, is located opposite the west bank of the legendary Pulau Weh, or Weh island, in northern Aceh, Sumatra’s most northern province. When compared to a U-shaped horseshoe, Iboih lies left of the arch. Its geographical location facing the wide Indian Ocean signals openness for anyone to come or leave at any time, but the memories and experiences received here will not be forgotten soon. The town of Iboih, located on Pulau Weh is the most westerly point of Indonesia. Pantai Iboih (Iboih Beach) will bring your expectations of 'natural beauty' to a whole new level. This small, hidden paradise has remained largely untouched by much of the tourist traffic, giving it a more relaxed and laid back atmosphere. Its forests are well protected by Iboih's charming coastline of golden sands that is strewn with giant boulders. The shallow ocean water which is so clear that you can see the ocean bed, has a bluish-green hue which exudes a feeling of peace and relaxation. The coast which appears to be curved, resembles lips, smiling and welcoming passersby to come and partake in its warmth and see the exotic flora and fauna of the tropical rainforests that are part of Indonesia’s natural wealth. Near the town of Iboih is a large protected forest reserve. It is no exaggeration when this protected forest is described as a paradise, as noted by many visiting tourists. You can explore the forests which has a lovely beach nearby that is available for when you want to cool off and swim among the small fish and colorful coral. The tropical forest trees also give shade to many parts of the sandy beaches. The most popular activities at Pantai Iboih are diving, snorkeling and jungle exploration. Pulau Weh and its surrounding beaches, including Pantai Iboih, are famous for their diverse underwater ecosystem. 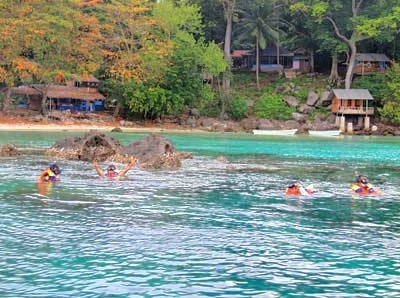 Iboih has many points for diving and snorkeling with calm waves. Slightly to the west of Pantai Iboih, tourists can also find surf locations where the waves are considerably larger. Exploring the Iboih coast with its inner hilly contours will give you an instant adventure. From behind the natural clusters of vegetation often peeks the bluish-green sea which surrounds the island. Along the length of the coast are many large boulders and rock formations which make for an interesting sight and great photo opportunities. Snorkeling is a favorite activity and many cannot wait to get their belongings stored in their rooms before diving into the blue ocean water to explore the coral beds along the sea bottom. Many tourists have affectionately described the Iboih waters as an aquarium, due to the clarity and variety of coral and sea creatures. Take a stroll down the beach to experience a peaceful but memorable adventure. You might be surprised when you realize that the majority of the sea at Iboih is not given to many waves. The generally silent atmosphere of the beach gives a completely different impression from other beaches with their loud, crashing waves. Another popular attraction at Iboih is the diving. Both experienced and not-so experienced divers come from around the world to witness the formation of a dormant volcano which lies beneath the surface of these waters. 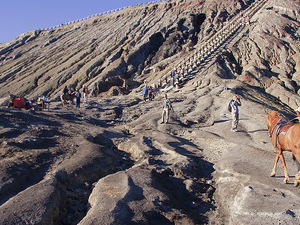 This volcano erupted in the Pleistocene era and is said to be what ultimately separated Pulau Weh from the main island of Sumatra. Diving around Pulau Weh, which has thousands of dive points, - one being at Pantai Iboih, - is said to be one of the best spots in Indonesia. Visit the dive spots such as West Seulako, Rubiah Sea Garden with the Honey Comb Moray Eel (a species of sea eel), North Rubiah with its calm waters, or Batee Tokong. Pantee Aneuk Seuke or 'The Canyon' offers caves, arches, walls and canyons often with larger visitors such as mantas, barracuda, the Moray Eel, and napoleon wrasse. Find other species while snorkeling or diving such as the frog fish, needle-fish, anthias, trumpet-fish, scorpion-fish, lion-fish, black tip shark, the hawksbill turtle, barracuda, nudibranches and other sea anemones all within these waters. Aside from the obvious marine adventures, Pantai Iboih also offers interesting jungle tours. There are many exotic species inhabiting the forest. 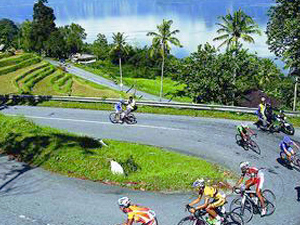 The Iboih Recreational Forest is situated adjacent to the Rubiah Sea Garden. 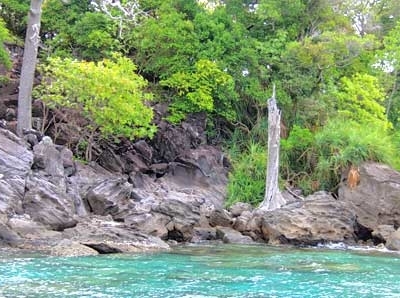 This forest covers about 1,300 hectares of area and is also protected as a special nature reserve for Pulau Weh. The forest is a thick, tropical jungle and although it is dense and rather difficult to wander through, visitors are encouraged to explore it with a guide. This forest is home to many kinds of animals. 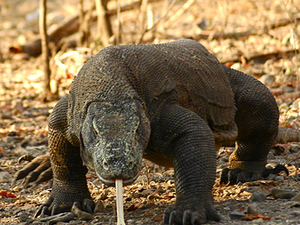 See wild monkeys, all sorts of reptiles, small and large, and an array of colorful birds. Or you may try your skill at spotting the Nicobar pigeon, not found in any other part of the Indonesian archipelago. At dusk wild boars and swarms of giant fruit bats are a sure sight. 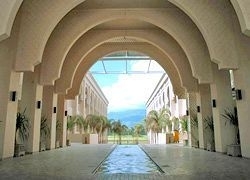 Iboih is equipped with fairly complete facilities and accommodations. Hotels, bungalows, cafes, restaurants, boat rental, diving and surfing equipment rental are all widely available here. Rental boats can be found in Iboih which offer a tour of Pulau Weh providing dozens of stop-overs for diving or snorkeling opportunities. 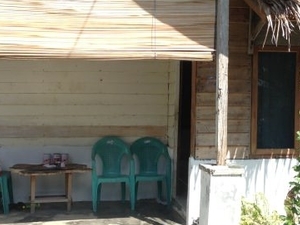 Accommodation in Iboih village is bungalow style - either on the beach, in the center of the village or just behind near the jungle. Bungalows in Iboih have greatly improved their standard over the last few years. Inexpensive bungalows are still there, but there are also now more bungalows with private bathrooms, even with air-conditioning and hot water. 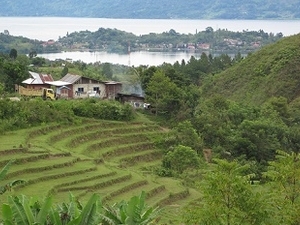 The majority of the bungalows at Iboih are in a row along the coast. Banda Aceh Airport is the gateway to Iboih, lying 40 km. to the south on the tip of Aceh Province. 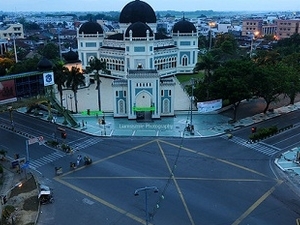 Flight time from Jakarta to Banda Aceh Airport is approximately 2 hours, 40 minutes. 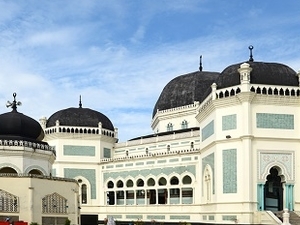 There are daily flights to Banda Aceh from Jakarta and Medan with Garuda Indonesia , Sriwijaya Air , and Lion Air.